One of the top local tecnico in Arena Coliseo Guadalajara. He's gotten mixed reviews from fans. Despite his stated desire to get a shot in the bigger Mexico City circuit, he's been passed by CMLL for others. 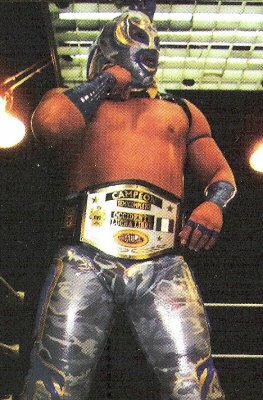 Still, despite programming and management changes, he continues to win a mask or hair a year, and has an ongoing feud with former ally Leon Blanco. Pacific Coast Tag Team Champions w/Vaquero Jr. This page was last edited on 19 March 2018, at 21:35.